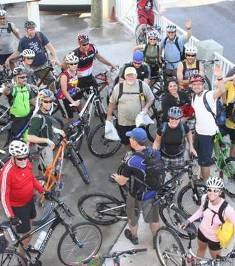 (CNS): Thirty eight cycling enthusiasts from Montrose, California arrived in Grand Cayman recently on the Royal Caribbean "Freedom of the Seas" to participate in a bicycle tour of the island. The bike cruise which was the first of its kind was led by Bike Magazine editor Joe Parkin and was organised to fit in scenic cycle trails at each port of call the ship made. In the Cayman Islands the visiting bikers were met by three time Olympian and well-known local cyclist Craig Merren, who accompanied the bikers on a tour along Seven Mile Beach and through West Bay, including areas such as Salt Creek, and 'Hell' before returning to the dock. The group sailed from Fort Lauderdale and organizers confirmed that as a result of the success of this year's inaugural trip, another bike cruise is already being planned for March 2012.